My sister constantly raves about Hotel chocolat and she is part of the tasting club, so I had tried the chocolates before and knew they were something special. I had never tried their plain chocolate-as in no flavours. So I was really excited when I placed the order for The mingles and jingles bag and super surprised when it turned up the very next day! The chocolates were packed really well in a box inside a box. 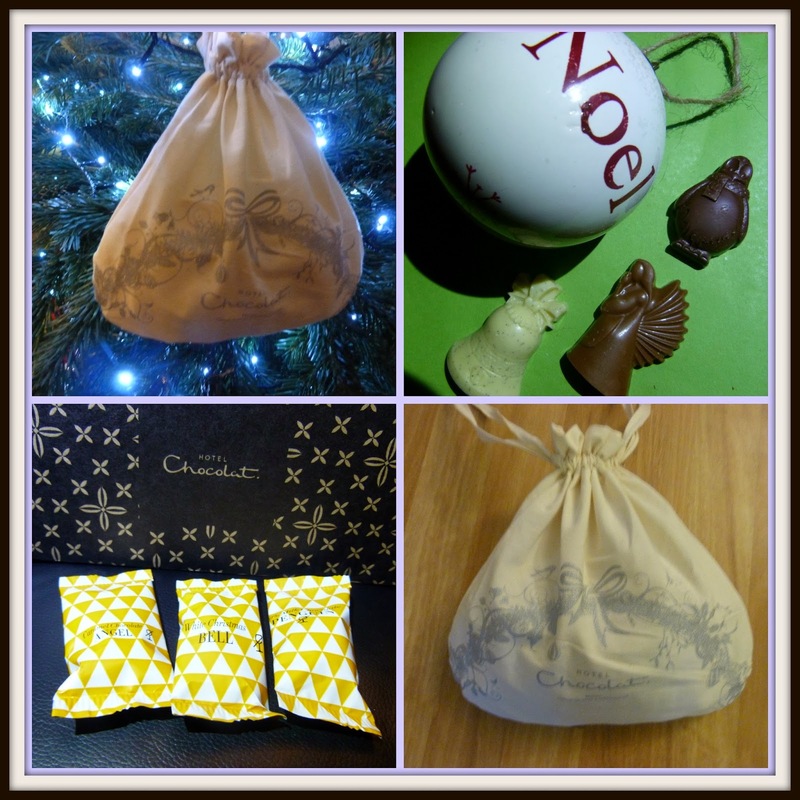 Then the chocolates were individually wrapped inside a little cotton draw string bag. The chocolates went down really well in our house, we are all chocolate lovers - we are quite selective about the brands. We are chocolate snobs and they sure passed the test! There are 3 different shapes a white bell, milk penguin and a caramel angel. The white bell was delicious and had a vanilla taste to it, the milk chocolate was a standard milk not quite as creamy as I like but it was nice. The caramel angel was devine, I expected a googy caramel to come oozing out but it didn't, it was just a caramel taste which actually, I much prefer. The angel was definitely my favourite. The chocolates were really chunky and a lot bigger than i expected them to be. At £21 for a bag of 35 chocolates I don't think is too bad. Its a luxury gift item that you would buy on special occasions. I think its would be a perfect gift for a chocolate lover or just someone your not too sure what to buy, after all who doesn't love chocolate? *We received the chocolates free for the purpose of the review however all opinions are my own.